Lady Jane Grey by Elizabeth M. Batt | Wendy J. Dunn, Award-Winning Author. Age at death: 16 years old. The statistics I believe speak for themselves. This noble young lady, this Queen of England, this child of sweet sixteen, beheaded on the orders of Queen Mary. 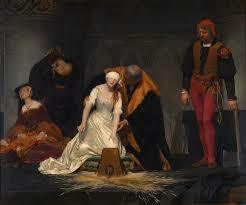 Executed within the confines of the Tower of London, Jane’s body still rests there to this day. Did Jane deserve this tragic end? What horrific crime must she have committed to merit such a tragic death? Murder perhaps? No, nothing so simple as murder. This girl was above such things, her crime was treason. Treason is a complex issue, not easily defined and quite often dependant upon the quirks and nature of the times. Pair it with falseness, misplaced faith and treachery and the guiltless can soon find themselves condemned. This was Jane’s demise; her tragic end the result of an epic game of chess. Jane sadly was the pawn, used for and by the nobles of England. After reading her story, you might view the term “noble” in a completely different light. Forced to accept a crown she did not want and a marriage she did not desire, Jane died a victim of circumstances that were beyond her control. She also died a branded woman – a traitor to the Crown of England. Whether that brand was justified is for you to decide after you read of her short life and sad end. Born at Bradgate Manor in Leicestershire to Henry Grey (Duke of Suffolk) and Frances Brandon, Jane received her name out of honour for Henry VIII’s latest wife, Jane Seymour. Jane Seymour had given birth to a long awaited and much desired son Edward, – England at last had an heir. Jane Seymour was Henry VIII’s third wife. Having divorced Catherine of Aragon and having beheaded Anne Boleyn, it seems his third marriage was a charm. His first two attempts at fathering children produced two girls – Mary I and Elizabeth I. Now Henry finally had the son that he had desperately sought. He wasn’t too long into this marriage, when the lady-in-waiting to his wife – Katherine Howard, caught his roving eye. This “rose without a thorn” Henry had to have, and so he divorced Anne to marry the nineteen-year-old Katherine. With Henry at the grand age of 46 years and Katherine a mere teenager, the company Katherine chose to keep was often youthful. Soon, rumours of infidelity began to surface and Katherine followed Anne Boleyn’s fateful path – she was executed on Tower Green in 1542. Lady Jane Grey left Bradgate Manor for the royal court at the age of nine. By this time Henry was into his sixth marriage and it was to Catherine Parr that Jane’s ward ship was given. On January 28 1547, at the age of fifty-six, Henry VIII died of natural causes. Catherine went on to marry Thomas Seymour – Jane Seymour’s brother, a man she had loved long before her marriage to Henry. When Catherine died in September of 1548, Jane’s ward ship was bought by Seymour who believed that with his connections at court, he could place Jane well enough that she might have a chance at becoming wife to the then king – Edward VI. So began the plot and the series of events that would slowly but surely lead Jane to the executioner’s block. In 1549, Thomas Seymour was arrested for breaking into the king’s apartments. After Seymour was executed for treason, Jane without her ward came to the attention of a man that would play the biggest part in her downfall – John Dudley. This Duke of Northumberland saw in Jane a chance to achieve the power that he had always sought. England at the time was in political and religious turmoil. Protestant was pitched against Catholic; Henry’s break with the Roman Catholic Church had far reaching effects. His daughter Mary was a staunch Catholic, his son Edward and the current monarch was an advocate for Protestantism. Mary behind Edward was the next in line for the throne of England. This might not have been a cause for concern for Northumberland had not Edward been a sickly child. It soon became clear that Edward would not survive into adulthood and if plans were not put forth, then Catholic Mary would ascend the throne. Northumberland himself was a steadfast Protestant who advocated anti-Catholic policies. The idea of a Catholic Queen was anathema to him, not to mention that his position would be dubious if Mary gained the throne – she wouldn’t hesitate to make him pay heavily for his anti-Catholic tendencies. Enter Lady Jane Grey. Fourth in line to the throne after her mother Francis, Jane was the solution to Northumberland’s problems. On her back, he could achieve the status and power that he had sought for quite some time. After befriending Jane’s parents, Northumberland gained their trust and convinced them to betroth Jane to his son, Guildford Dudley. In May 1553, Jane was summoned by her parents and informed that she was to be married to Guildford. Believing herself promised to Edward and with dislike for Guildford, her protestations were strong but futile. She would marry Guildford regardless, her parents insisted upon it. On May 21 1553, Jane was married and moved to Dudley House. Edward VI meanwhile had grown even weaker and with time elapsing rapidly Northumberland stepped up his plans. Turning to Edward, he convinced the king to strike Mary from the succession line. Edward could not act upon this alone; he needed the consent of Parliament to enforce it. The English Parliament was extremely reluctant to carry forth Edward’s request, but Northumberland using abusive tactics and threats persuaded the council members to sign a document eliminating not only Mary, but also Elizabeth from the line of succession. Where did the line of succession lie now? Firmly at the feet of the Grey’s – two in particular, Francis and Jane. It is not clear whether Francis had a premonition of what was to come, but regardless, she stepped aside to leave the throne vacant for her daughter. Upon the death of Edward, Jane would become Queen. On July 6 1553, Edward VI met his end. Jane was summoned to Syron House and informed that the throne was hers. This was the last thing Jane wanted. Having no desire to become Queen, she relented only when told that it was “Edward’s will.” On July 10 1553, Jane was welcomed to Westminster as the titular Queen of England. She would reign for just nine days. So what of the other players in this game of chess? Mary, having been forewarned about Parliament’s signed document, fled to Norfolk to evade capture. Northumberland was elated; he now had all the power and recognition imaginable. With Jane as Queen and his son as her husband, Guildford would rule at Jane’s side. Northumberland of course could rule through Guildford. It wasn’t that cut and dried however, for Northumberland had underestimated England’s Parliament. Still smarting from Dudley’s bullying, Parliament sent him off to seek out Mary and bring her back to face the music. While Dudley was attending to this mission Parliament began to question his authority and after much discussion pronounced him a traitor. They pledged to put Mary where she rightfully belonged, on the throne of England. Jane with some relief was told to relinquish the crown. She did so willingly having never wanted it in the first place. Now she could return home…or so she believed. On July 20 1553, Northumberland, his son Guildford and Jane were arrested and taken into custody. Imprisoned in the Tower of London to await their fate, Dudley believed that by denouncing his Protestant beliefs he would be spared. It did him little good. He was executed on August 23, 1553. On November 13 of that same year, Guildford and Jane went on trial. Both were charged with treason and both were sentenced to death. Mary was reluctant to have Jane executed and Jane might very well have escaped her fate but once more she fell victim to another’s actions that sealed her doom. Jane’s father Henry Grey participated in a rebellion to oust Mary from the throne. Mary’s hand was now forced, she had no choice but to sign Jane’s death warrant. Jane was buried at the Tower of London. Even in death she never returned to her beloved Bradgate Manor. Jane was reported to have been one of the most intelligent women in England. So why didn’t her intelligence save her? Or was it that at sixteen, her innocence and naivety brutally betrayed her? In all likelihood and setting intelligence aside, her short life was dictated by forces beyond her control. By her sixteenth year, she’d been married, been Queen of England and had been executed. Her future signed and sealed by the “nobles” of England. Bradgate Manor now lies in ruins amidst the grounds of Bradgate Country Park. The park is frequented by tourists all year around and also hosts a deer reserve. Some say that on certain nights, a figure of a young girl in Tudor attire can be seen wondering through the ruins. Perhaps Jane did reach her beloved home after all? For more about Elizabeth Batt, please visit her website.